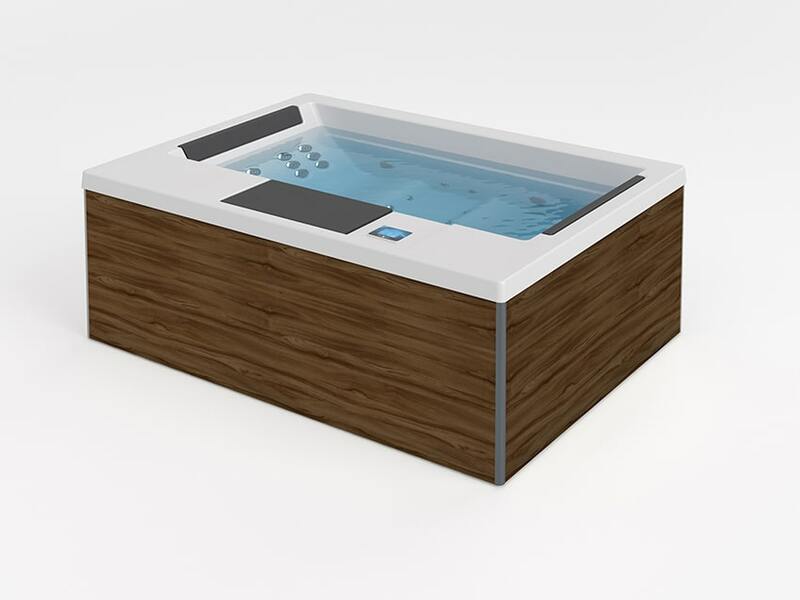 This hot tub has a stylish design, above all aimed at couples and intended for private residences and hotel suites. Its compact dimensions (203x150x72) enable 4 different positions inside the hot tub, two of them in the form of ergonomic loungers. 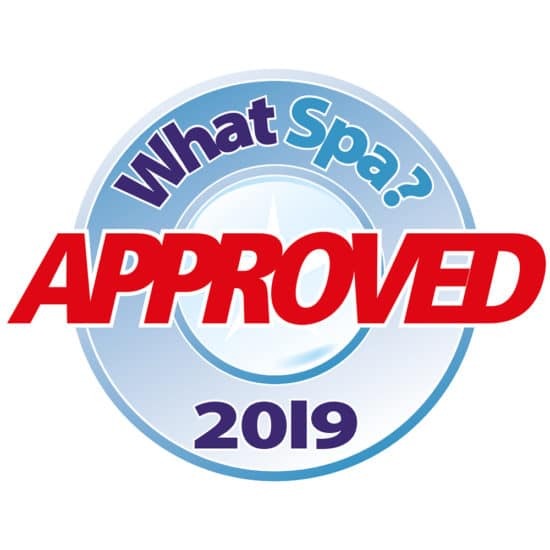 The 28 massage points, arranged in 20 jets and 8 air nozzles, have been carefully designed and located to provide a relaxing back massage from top to bottom, together with bubbles that activate blood circulation from your feet to your buttocks. Without a doubt, the restorative effects are extraordinary. This model also stands out for its favourable height, which facilitates access to the hot tub, the display featuring the Balboa control system for controlling basic and programming functions (switching on, filtration), its two comfortable headrests and four LED lights, which create a welcoming ambience, in accordance with the concept and philosophy of this model. 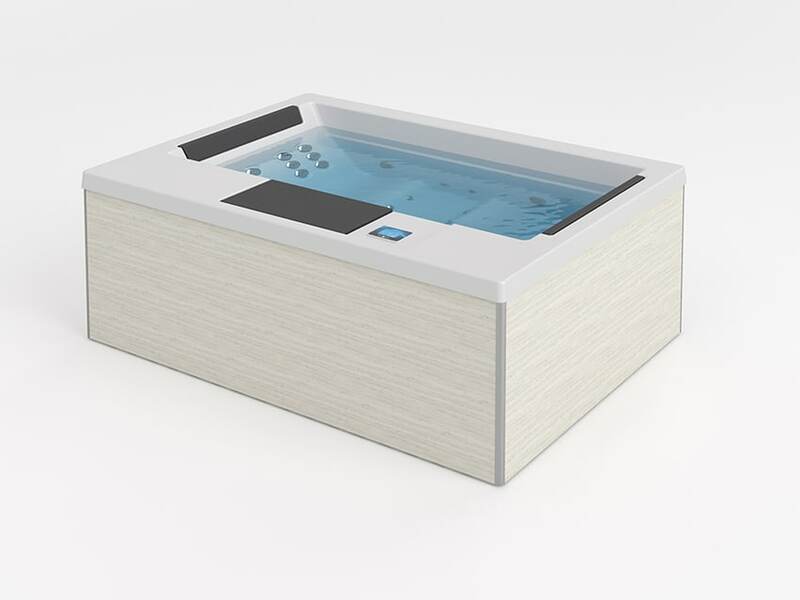 It is available in different acrylic and wood finishes and allows any of the optional features from Aquavia Spa to be incorporated, both in terms of energy efficiency and purely aesthetic aspects. Without a doubt, the Suite is a seductive hot tub designed for intimate and unforgettable moments with your loved ones. Select the finishes to see the result of the possible combinations. You must select at least one finish for each type. These two finishes cannot be combined. Thanks to its low height, you can get in and out of the hot tub easily and safely. LED spots at the bottom of the hot tub that allow you to light up the inner perimeter. The LED spots are fully synchronised with the rest of the hot tub’s spot lights, allowing you to choose the best atmosphere for your chromotherapy session.